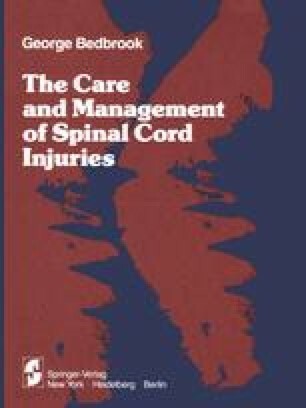 The usual physical signs that aid medical diagnosis in the normally injured patient may be absent in the paraplegic and tetraplegic because of the trauma to the spinal neuraxis. Therefore recourse to ancillary diagnostic services such as basic roentgenograms and basic pathologic tests must be made. Throughout the entire period of diagnosis and continuing into the 6 weeks of early management, careful attention to detail during physical examination cannot be overstressed. It must also be remembered that patients with spinal paralysis are prone to certain complicating illnesses. These include urinary tract infection, pressure sores, venous thrombosis, respiratory dysfunction, coronary heart disease, and obesity.